Welcome to the 14th episode of the DFB Podcast! For this episode’s main segment, AJ and Brad chat about their favorite dining-focused resorts at Walt Disney World and Disneyland. Many of these resorts have a lot of great choices within pajama pant distance — as in: walk downstairs, sit, eat, enjoy! Kathleen G.: In April, I will be spending a day and evening at Epcot with my husband, who wears two hearing aids, and our 9-year-old son. I want to make an ADR at Epcot for dinner, and am looking for a table service restaurant that we will all 3 enjoy. So what would be your top 3 choices for a relatively quiet table service restaurant for us at Epcot, or within easy walking distance of Epcot? Joel E. What foods are basically the same throughout the theme parks (or IRL, like popcorn)? So we don’t splurge or take time getting something somewhere, when we could get it cheaper or in a more relaxed/pleasant setting elsewhere? Where at Walt Disney World can you find this quote on the wall? “It is the pot that boils but the dish that gets the credit.” Send your answer to trivia@disneyfoodblog.com to be entered to win a Disney Food Blog Dining Guide e-Book of your choice! 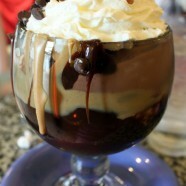 About the Picture: The famous No Way Jose sundae from Beaches & Cream, a restaurant we heartily recommend in the Epcot Resorts ‘hub’ at WDW! More Restaurant Recommendations! Want to know more about resort dining at WDW and DLR? Our Best Disney World Restaurant Series can aid you in your culinary journey! And of course there’s our general Disney World Restaurants Guide and Disneyland Restaurants Guide as well! I just discovered your podcast and love it. I went back and listened to them all. You do a great job of providing up-to-date information with lots of happiness tossed in. I recommended and reviewed your podcast on my Disney website. Here is the link. http://agoofyidea.com/get-great-disney-dining-information-with-the-disney-food-blog/ I look forward to hearing more episodes of the DFB podcast. Where are you guys? I need a new podcast! Please do more podcasts more often. Thanks! Yo guys what happened to you? I’ve been waiting patiently for the next food blog and am getting worried! Buy the way you two are doing great! Hope to meet up with you AJ sometime in the future & hope to see you and your wife again Brad. By the way, have either one of you had a pickle from the pickle stand in EPCOT near Test Track. They are great, especially on a hot day. Try one, you wont be disappointed. See you on Grownups! MrHub — We’re comin!!! Brad was sick for a while, but he’s on the mend. We’ve got a new podcast all queued up; just have to tape and edit! Leslie B — Coming soon! Whew! Good, you were getting me worried there for a little! Hope Brad’s feeling better. We’ll be waiting anxiously.